Ventana Mesa Creek and South Fork Devils Canyon vie for the most rugged streams in the Ventana. Both canyons contain stunning waterfalls, large pools, rock scrambling complexities, micro-navigation and a true feeling of unspoiled wilderness where few humans have set foot. In fact, it may have been 20 years since Ventana Mesa Creek’s last visitor. I have been intrigued by Ventana Mesa Creek for awhile and the ruggedness and beauty of the stream exceeded my lofty expectations. I had previously attempted the creekwalk last winter but didn’t get far, getting turned around at the top of the first falls by high flow and treacherously slick rock. During the winter the steep, narrow walls preclude sunshine from penetrating into the canyon so seeps from the cliffs keep the rock wet. Moreover, since the canyon is shaded frigid air tends to pool into the canyon. This produces a dangerous combination of shivering and slippery rock. It turns out Ventana Mesa Creek is most safely negotiated in late spring or summer when flow is low and the sun reaches the bottom of the canyon to dry out the rock scrambling portions. Attempting Ventana Mesa Creek in high flow would likely require ropes and wet suits. The Ventana Mesa Creek Loop is close to a complete loop and came in nearly 35 miles with around 10 miles of that off-trail and many of the trail miles being very brushy making it one of the most arduous routes I have done in the Ventana. As with most of my routes in the Ventana, the incredibly scenery more than compensates for the effort and the knowledge that few humans have experienced the depths of Ventana Mesa Creek make this route especially rewarding. GPS route on Strava. Photo album here. Ventana Mesa Creek meets the Carmel River at its gorge, with its towering cliffs, deep pool and a beautiful waterfall. This is one of the most rugged stretches of canyon in the Ventana Wilderness and Ventana Mesa Creek is right in the middle of it. Just upstream of the confluence with the Carmel River is a very nice ~25 foot falls spitting over a smooth rock ledge. I was impressed with this falls in the winter and was not expecting additional falls of this magnitude upstream, but I was surprised to find two major waterfalls upstream of the “Entrance Falls,” both taller and more impressive. Above the Entrance Falls is a pretty turquoise pool and around the next corner is a spectacular emerald pool with another smaller falls over slick rock. There are countless smaller cascades and pools and a few are particularly picturesque. These pools and cascades culminate in an stunning waterfall I called “Ventana Mesa Falls.” This falls contains a large pool with a circular amphitheater of tall cliffs. The water tumbles at least 50 ft, all in free-fall. After Ventana Mesa Falls, the creek becomes more subdued and even retreats underground for a stretch before reemerging near the tallest falls along Ventana Mesa Creek at ~2,750 ft. This upper falls contains two segments, with the upper segment being much taller, in an aggregate height of 70-80 ft. Similar to Sugar Falls near the headwaters of South Fork Devils Canyon, this falls is located near the headwaters of Ventana Mesa Creek and is not a high flow falls, but instead achieves its beauty through its delicate nature. The falls does not really contain a plunge pool, but its lush setting is unmatched by any of the Ventana waterfalls I have seen. Thick moss cloaks the entire rock facade, both underneath the watercourse and on the surrounding cliffs. Other vibrant green vegetation, including a large colony of five finger ferns, hangs from the cliffs besides the falls. “Hanging Garden Falls” seems like a very fitting name for this magical cataract with its hanging garden of ferns and moss. Above Hanging Garden Falls I scrambled up to the Ventana Spires Ridge via a talus gully and some fairly solid rock scrambling amid Santa Lucia Fir groves. This narrow ridge separates the Ventana Mesa Creek drainage from the unnamed tributary draining Ventana Cone. This is one of the more remote regions in the Ventana Wilderness and the heart of the Santa Lucia Fir growing region, the rarest fir in the world. 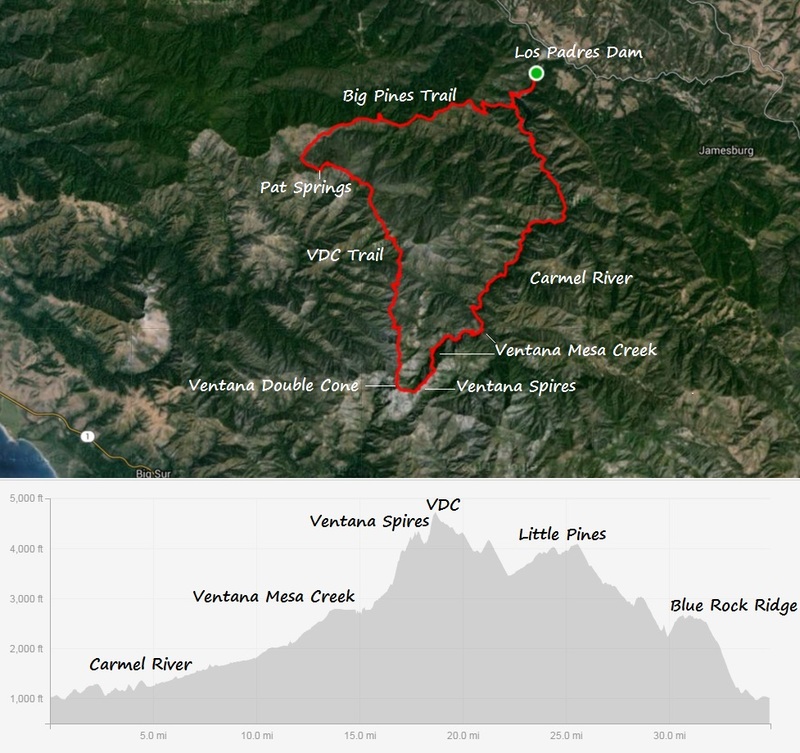 The ridge features excellent views in all directions including Ventana Cone, South Ventana Cone, Cone Peak, Ventana Double Cone, the Big Sur River watershed, and virtually all of the Carmel River watershed. This ridge is the most alpine I have seen in Big Sur with Santa Lucia Firs, pines, steep cliffs and wildflower meadows. Unlike the Ventana Triple Crown route, this ridge contains little brush, a rarity in the Ventana, One can walk along the ridge and enjoy unfettered views and enjoyable scrambling up the three rugged pinnacles that form the Ventana Spires. From the Venana Spires I retraced familiar ground and headed up to Ventana Double Cone and returned to Los Padres Dam via Pat Springs and the Big Pines Trail. As of late May the ceanothus on the Ventana Double Cone trail has had a strong spring growth and there are extended sections of brush push throughs where the trail is essentially invisible but for the tread underfoot. Volunteers have worked on some sections of the trail, but others sections are deteriorating with another year of brush growth. I have also noticed a lot of low brush growth on the traverse beside Uncle Sam Mountain. This is more of an invonenience, but more evidence that the trail to Ventana Double Cone is not going to become a wilderness freeway or “easy” anytime soon. The trail is in great shape from Little Pines to Pat Springs, a heavenly spot under the pines with refreshingly cool spring waters. The upper part of the Big Pines trail is in good shape as many big blowdowns have been removed, but the middle section is becoming very brushy and the infamous Big Pines poison oak jungle is as healthy as ever. The Big Pines Trail gets very little use and the brush growth, tall grass, and flourishing poison oak is making the trail tough to follow in spots. This pretty trail is an aesthetic connector from Los Padres Dam to Pat Springs so I hope it will not lost. where along the routes are the waterfalls?